In 1893 George Pullman lived in a mansion among his fellow magnates at 1729 South Prairie Avenue. This was near the site of what was then called the Fort Dearborn Massacre. Pullman decided to erect a monument to the event on his property. The finished bronze sculpture was the work of Carl Rohl-Smith. Set upon a stage-like base, it measured 8 feet by 9 feet and was 5 feet deep. A famous incident in the battle is portrayed — the Potawatomi chief Black Partridge is raising a hand to rescue Margaret Helm from another, tomahawk-wielding Potawatomi. “The Fort Dearborn Massacre” remained in place until 1931. By then the neighborhood had become a run-down industrial district. The monument itself was neglected and vandalized. Pullman’s will had left the public art to the Chicago Historical Society, in trust for the City of Chicago. The Society now took over. The monument was refurbished and moved to the lobby of its headquarters. There it stayed for decades. “Massacre” is a loaded word. 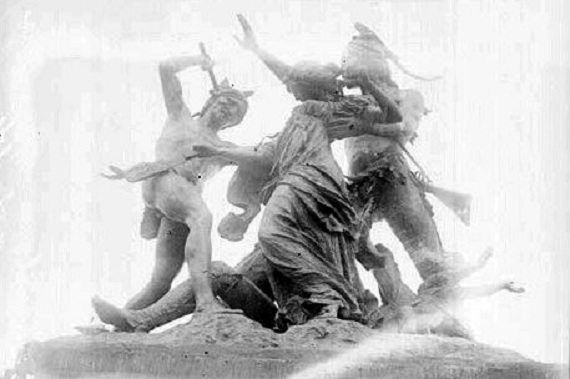 In 1972 the subtitle “The Potawatomi Rescue” was added to the monument. Still, some critics objected to the work itself, saying it presented a biased viewpoint. During the 1980s Prairie Avenue was restored as a historic district. 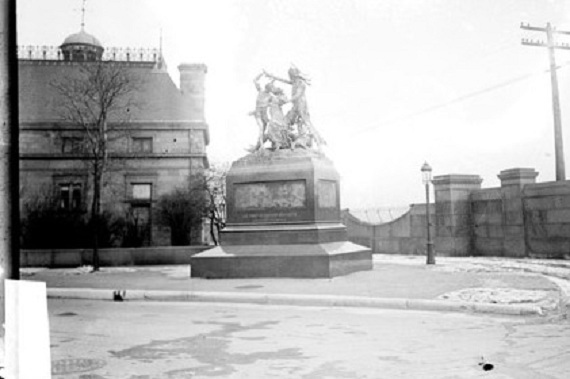 The monument was then returned to its old neighborhood, being displayed on the grounds of the Clarke mansion. Today Rohl-Smith&apos;s sculpture is nowhere to be seen. It was removed from the Clarke grounds around 1997, and is stored in a warehouse, supposedly awaiting another restoration. A proposal to locate the monument in The Battle of Fort Dearborn Park has been opposed by native groups.